It's so upsetting to watch. And to think two years ago, this type of disaster hit very, very close to home. Staggering and hard to grasp a number that big. Exactly. What puts this in perspective for me is our wildfire "event" basically lasted 3 days, and the worst of it only occurred in a 24 hour period when the fire spread into Gatlinburg. Imagine that fire lasting for weeks and engulfing nearly half of the National Park. Or imagine a fire big enough to swallow up a city like Knoxville or Nashville. That's what happening in California. Here is a website with a interactive map. You can zoom out and see just how big the fire is if it was in your back yard. I brought the fire over the Knoxville, and the city from one end to the other would be gone (including the suburbs). Actually, over half of Knox county would be on fire. We were very fortunate that enough rain fell when it did so our fire could be contained. I frequent some of the darker places on the internet from time to time. Yesterday I found a video of a guy showing the damage on a road from the fire up by Paradise and the whole road was filled with burned out cars with completely charred human skeletal remains inside of them. Just on that little stretch of road I counted 10 people dead. I couldn't imagine what they were thinking near the end. It maybe quite some time if we find out the missing are dead or alive based on how little actually remained of those poor souls. Its just a very sad and desperate situation all around. For more perspective, here is what the fire would look in Sumner County. Unreal. I couldn’t imagine all of Gallatin and Hendersonville being gone. The town of Paradise is about Gallatin sized in area and population. It is like burning down an entire Gallatin, Hopkinsville, or Cookeville. I saw a video on Youtube that was a dash cam. A father was trying to get out of the Paradise fire. He had two of his kids in the car. Tree limbs that were on fire were falling on their car. Fire on both sides of the road. The kids were crying “ Daddy are we going to die?” They were so terrified. Dad kept trying reassure them but could hear the uncertainity and fear in his voice. Their car was getting hotter and hotter inside. One of the boys asked if their car was going to blow up. It was so heart breaking. But good news was the did get out. But I just could not imagine what they were all going through. With a Mediterranean climate (mild, lots of sun, and very dry outside of the rainy season), many are drawn to California. It can be a paradise. But you pay for it by summer's end, because it doesn't usually rain much after April. Between the earthquakes and fires, I'll choose to stay in east Tennessee. We may have both, but on a much smaller and infrequent scale. Fire is a way of life in that area. There are trees there that require fire to disperse their seeds. With that said the quick speed and intensity are pretty unusual and is likely related to a combination of climate change (created more extreme alternations of precipitation), the build-up of brush and other debris, citizens encroaching unto areas that are prone to fire, and the overall climate of that area. Fire is nature's way to clean away dead/diseased trees and underbrush. If not for our suppression efforts, it would probably be far more widespread here during drought years like 2016. But the semi-arid/desert areas of the southwest dry out every summer and fall. If you're going to live there, you have to know fire will threaten you at some point in your lifetime--guaranteed. The more we populate areas like that, the more frequently these tragedies will happen, unfortunately. I didn't realize this but this is the same general area that had the dam that was about to fail due to unsually heavy rain during the Winter of 2016-17. I moved on June 1 and it rained for 20 minutes or so one morning in October. I love SF and the climate so far, at least up until the smoke, which is expected to continue through Wednesday when the first winter rain comes. It's definitely been an odd and (mostly due to the duration) an unpleasant experience. SF is a very small, compact city and culturally doors and windows are left open a lot. The smoke, masks, and haze combined with the homeless population has made it feel a bit apocalyptic at times. That said, the Bay Area is stunning and the smoke is kind of beautiful at times. I feel pretty bad for the responders to the fire. Obviously, I think California firefighters are completely exhausted. But reading some of the statements from officials in Butte County, I really hope they receive good access to mental health services. 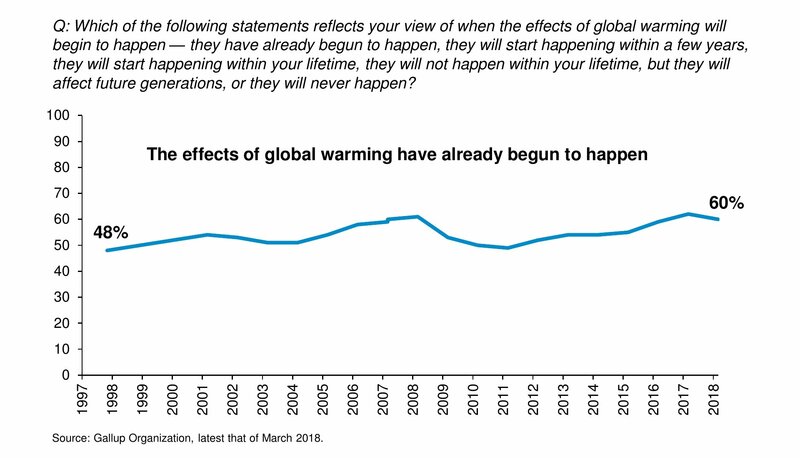 I think we've been pretty respectful discussing climate change, so I feel fine posting these charts. 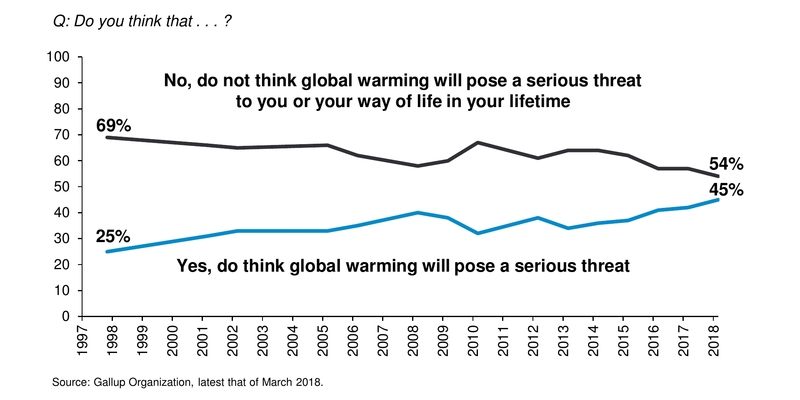 Basically, Americans increasingly believe climate change is occurring, but don't rank it a top policy priority. 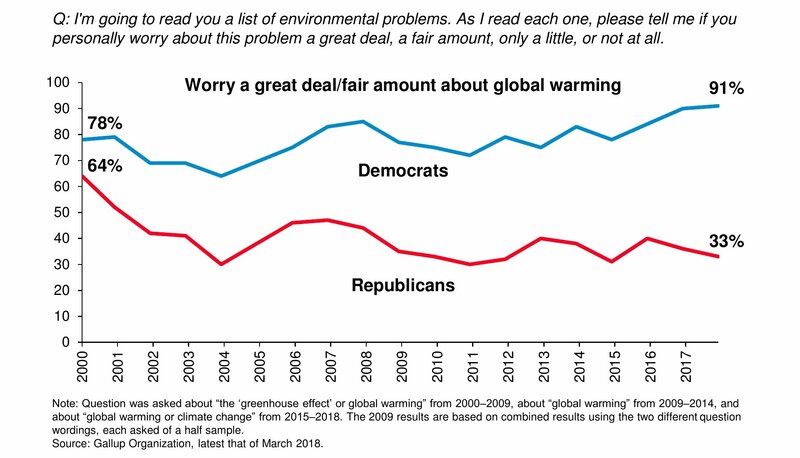 The huge caveat though is, as mentioned already, Americans are increasingly partisan in how we view climate change. That's a bummer because addressing or discussing climate change doesn't have to be partisan. I read a good book a few years ago called "How to Think Seriously about the Planet: The Case for an Environmental Conservatism" that made the case that environmentalism was inherently conservative. He was coming from a European conservatism point of view, but a lot still applied. Again, the below is just polling - not a referendum on who is right or wrong. The last poll surprised me actually. Not to get too far off topic, but this video of the Chalet Village Fire in Gatlinburg 2 years ago is truly mind-blowing if you haven't seen it already. The Camp Fire is this on steroids. Please keep in mind this video is NSFW. I can't prove or disprove global warming (caused by man). I'm not that smart. But I can at least try to be a good steward of the planet I live on now so those generations that follow me have a decent place to enjoy, as I have had. That's my motivation whether or not global warming, or "climate change," is real. I have never watched that video. Holy crap. Honestly, they kept their head pretty well given the situation they were in. I knew the outcome and STILL felt nervous for them watching that video.